Description: Completely re-manufactured Project 1147-44 CVL, with KIROV CGN, SOVREMENY DDG and VICTOR I SSN task group. Animated rads, the VICTOR submerges, huge poly reductions, reasonably detailed, texture mapped, full hull and acceleration enabled(2 cats, 4 wires, helio pads). KA-25 and KA-27 AI plane guard helio's. All nice and slippery on FPS. 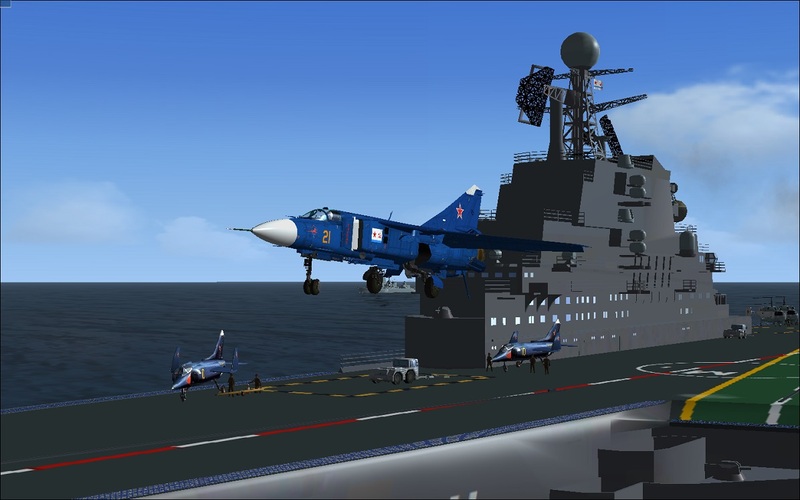 So you'll have something to fly, a MiG-23K naval version of Alphasim's FLOGGER, Hooked, ASM's on dropped object condition so you can shoot stuff from a saved flight. Accel enabled, bumps and specs done. Next is a naval version of Piglets L-29 as a 'MAYA-M' deck landing trainer, also hooked and cat enabled.